Shed 34 - Who are they? 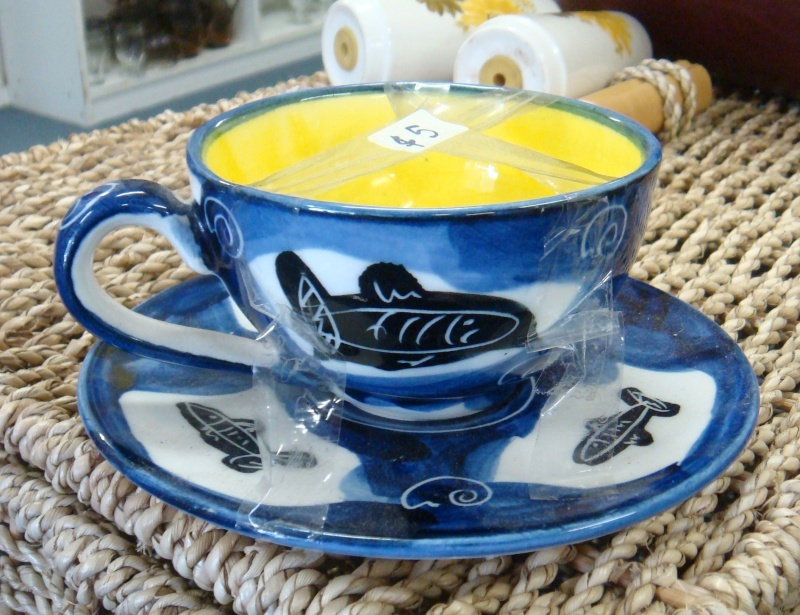 I came across this cup and saucer while op-shopping in Wellington, too expensive for me now, but I wondered who made it, as Le Shed is all I could think of. Any ideas? Re: Shed 34 - Who are they? This is another Shed 34 item. 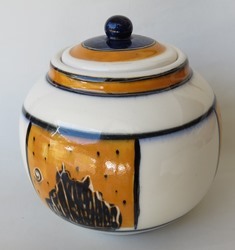 A VERY nice, very well made kitchen jar that has the honour of living on my bench! 14 cm high. The lid fits neatly, everything about it screams class and quality. Who were they? 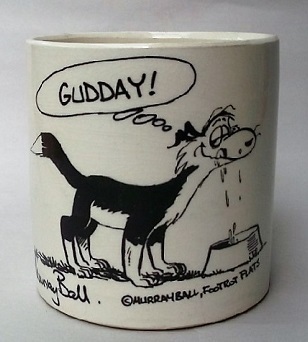 It is similar in style to Gill Duncan, I have wondered if they are connected.. 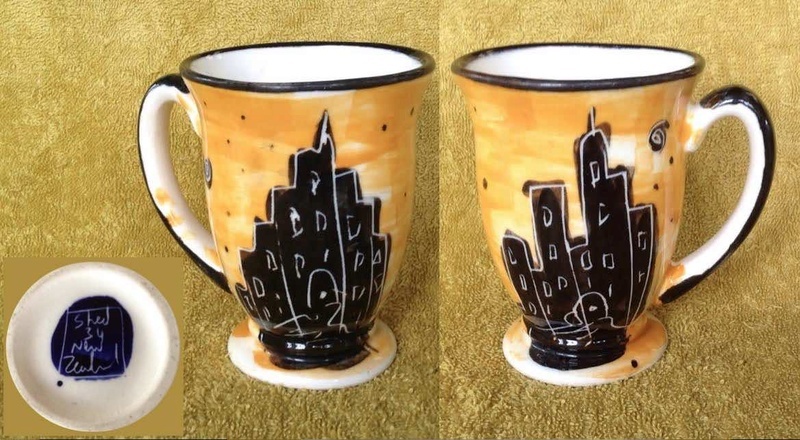 Shed 34 mug with cityscape deco - Jim Ellis? 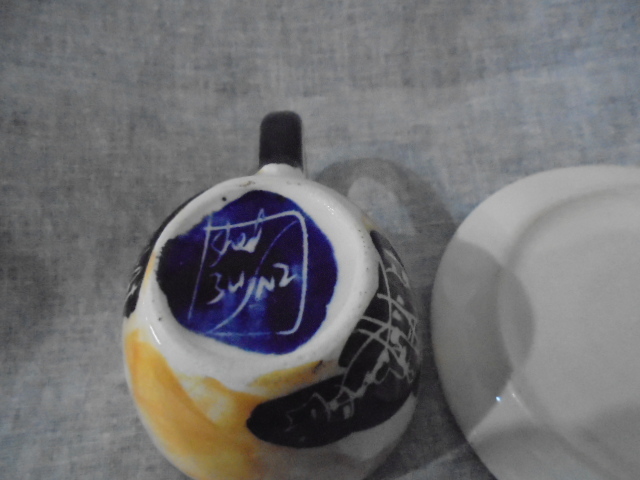 I bought this one from the same seller as my Penny-Madden/Mike-Richardson mug. 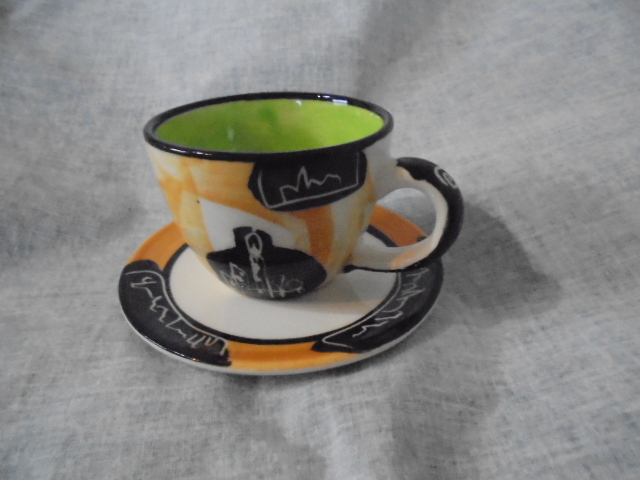 The city scenes appealed to me and frankly I did not fancy my chances of seeing another Shed 34 mug. 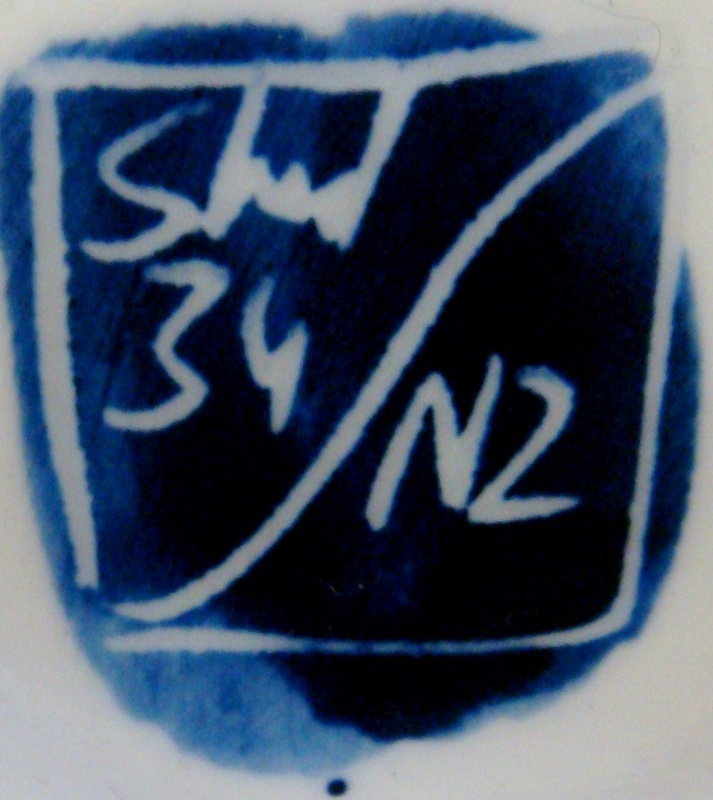 The potter's mark varies from the one in the gallery in that it lacks the diagonal mark that gives the other some similarity to that of Gill Duncan, and "New Zealand" is spelled out. I was expecting a handpotted piece but apart from a lack of telltale hollowing inside at the handle connecting points (and no obvious mould lines or signs of fettling) it appears to be slipcast stoneware. It is similar to other slipped mugs but I cannot recall seeing a match for the shape elsewhere. 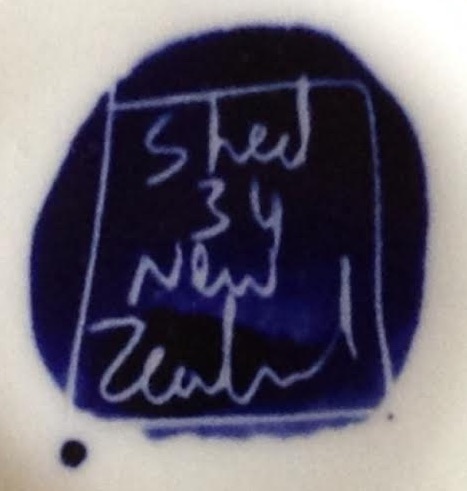 I have not identified who "Shed 34" is but one of the events in or coinciding with the current Auckland ceramics festival gives us a good clue. The web page for the "Open Studio Waitakere" 2016 tour http://www.openstudioswaitakere.co.nz/shed-34-artists/ refers to "Shed 34 Artists", who will convene at Jim Ellis' studio in Shaw Road Oratia on the 19th and 20th. If the Shed 34 pottery is not Jim's work then he is sure to be able to point us in the right direction. I keep getting a niggly feeling that Shed 34 could be related to the Corban's Arts Centre, but can't find any reference on the net though. Artists have used the sheds there to produce work for many years, including Peter Lange. In the course of my googling I also found a reference to Shed 37. I made a montage of the two marks from which I see that, although they have the differences I mentioned above, the handwriting indicates that they were made by the same person. And I quote: Artists include: Fiona Henderson, Carissa Hine, Marie McNeil, Roy Wangford, Vince Mariposa, Rachel Parker, Tracey Singer and Jim Ellis.